If you’re looking for tips on how to prevent staining your teeth, you’re in the right place! Everyone wants to have a beautiful, bright smile, and there are ways to achieve and preserve that. Yellowing of the teeth can occur from environmental factors and bad habits, but fortunately our orthodontist in Raymore, MO, has some pointers for you to maintain your perfect smile. If you regularly consume coffee, tea, or red wine, there is a high chance that these are affecting how white your smile is. For coffee and tea, one way to avoid staining is to add milk to lighten the color of the drink. The darker and more concentrated your drink is, the faster your teeth will become stained from it due to the acidity. Milk will bind with these staining acidic agents and actually protect your teeth from their effects! As for red wine, the main cause of staining is the dark, naturally occurring compounds in the grape skin called tannins. If you enjoy red wine, the best way to prevent staining is to brush your teeth before you begin drinking, as there will be no plaque for the tannins to attach to. Sipping water and eating while drinking wine will also help keep the staining away. It’s important to keep up on brushing and flossing, not only for your general dental and orthodontic health but to prevent plaque and tartar buildup. Plaque and tartar provide a layer that staining agents can “grip” on to, making it more likely for your teeth to stain. Make sure that you brush and floss twice daily for a bright smile! 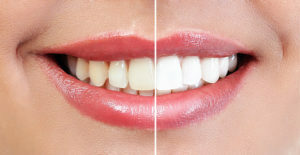 Whitening treatments at our orthodontist’s office are a great way to improve your smile. However, if you have teeth that tend to stain easily or frequently drink coffee, wine, or smoke, you should incorporate a whitening toothpaste into your routine. This type of toothpaste will help prevent staining between whitening treatments! Contact Our Orthodontist in Raymore, MO, Today to Find Out More! The information provided in this article is not meant to be medical advice and is for educational purposes only. If you would like to learn more about braces, Invisalign, or other orthodontia-related topics from our orthodontist in Raymore, MO, feel free to contact Burleson Orthodontics by calling 816.759.0123.